Mediterranean mood: Like the fare, the decor incorporates both Catalonian and local influences, with an airy, sophisticated outdoor dining area. There are some things holidaymakers may expect before setting foot on Phu Quoc. Idyllic beaches? Yes. Barrels of fresh fish? Definitely. Authentic Spanish cuisine? Probably not. And while the island is fast becoming the pearl in the country's tourism crown, there is another hidden gem waiting to be found by those flying in from the mainland. 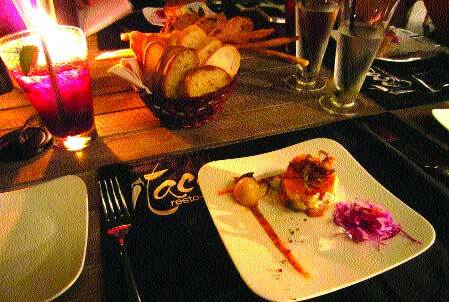 Enter, Itaca Restaurant and Lounge. The authentic Spanish eatery was established two years ago by a founding partnership of Spanish restaurateurs. The restaurant is now a culinary institution and Phu Quoc's only fine dining venue outside the island's clutch of high-end resorts. The restaurant's mission is to provide contemporary Catalan and Mediterranean dishes with a twist (and a dash of Asian spices). The result is an exciting and innovative fusion of the two regions renowned for tantalising the taste buds. East meets west on a plate. Like the owners, the restaurant's architect Pep Vich also hails from Spain. True to Mediterranean style, Vich has designed the restaurant with a mindfulness for outdoor spaces. Walking into the restaurant feels like walking into an airy and sophisticated outdoor venue that could easily be at home in Ibiza or the Greek islands. Round, white lounges sprawl into the restaurant's open courtyard, while outdoor grass areas merge seamlessly with undercover seating. 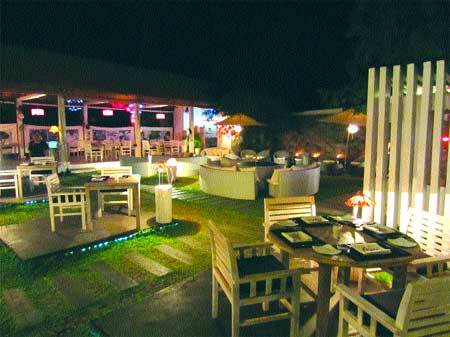 Diners can also retreat to the Lounge's cushiony cabanas next to the patio-style bar. In the back, a raised concrete platform provides a rustic undercover dining area overlooking the restaurant's tranquil courtyard. Looking out of the restaurant, patrons can immerse themselves in intricate alfrescoes painted by artists from the Catalan region. The decor also incorporates iconic local elements. Conical hat lamps adorn concrete stucco walls while wire poultry cages dangle from the ceiling, twinkling with fairy lights. The restaurant is an ode to authentic Catalan and Mediterranean cuisine. Chefs use local produce and specially imported Spanish ingredients to create authentic, Spanish flavours. Even the chefs have been brought from Spain. If you're like me, hearing the word "Mediterranean" makes you salivate over thoughts of deliciously flavourful cuisine and jugs of fresh sangria. Visitors will be pleased to know that Itaca delivers on all of these. On arrival, diners should take the opportunity to soak up a jug (or two) of freshly made sangria and recline in the plush lounges before making their way to the dining area. Visitors can also choose from a vast selection of international wines and a list of cocktails expertly mixed by the restaurant's attentive staff. Wanting to take advantage of the first authentic Mediterranean restaurant we'd come across in Viet Nam, we ordered pretty much - well - everything. A bitey German potato salad with boiled cabbage, quail egg and mustard and honey sauce gave us the ideal introduction to the restaurant's fare. A cohesive dish, it offered a mix of textures and a harmonious blend between sweet and salty flavours unique to Mediterranean cuisine. A serving of marinated anchovies prepared "Catalonia style" also whetted the appetite. The anchovies, like most seafood in Phu Quoc, were fresh, flavoursome and well seasoned. Comment: A fusion of Mediterranean and Asian cuisine. More than your average lounge. One of our favourite dishes of the evening was the restaurant's take on a tabouli salad. Fresh, spicy flavours danced on the palette and like its predecessors, the dish's flavour changed with each successive bite, demonstrating a profound depth of flavours unique to fine dining establishments. We then made our way through a deliciously inventive goat cheese salad, which arrived encased in a golden envelope of puff pastry, complimented by a tangy mustard sauce and served with fresh greens. Other delights included the fresh spring rolls with salad, beef carpaccio and the restaurant's freshly tossed garlic prawns sprinkled with a dash of paprika. After a few courses a pattern emerges. Freshness, eclectic flavours and a Spanish flair for presentation underpins every dish. Despite the use of powerful ingredients, each dish shows a skillful balance of flavours. The restaurant's iteration of a Thai Sea Bass Curry also demonstrates this. However, visitors cannot go past the restaurant's outstanding tuna tartare served with wasabi mayonnaise and tomato paper. The soft, delicately diced and beautifully seasoned tuna blends perfectly with the tangy tomato and the wallop packed by the sumptuous wasabi mayonnaise. By far the table's favourite, it was cleverly conceived and expertly executed. For dessert, we indulge ourselves in a decadent spread of banana stuffed pastry, served with hints of passion fruit and strawberry; a molten chocolate "bomb" cake and a delicious apple tart concoction. Each outstanding in its own right.